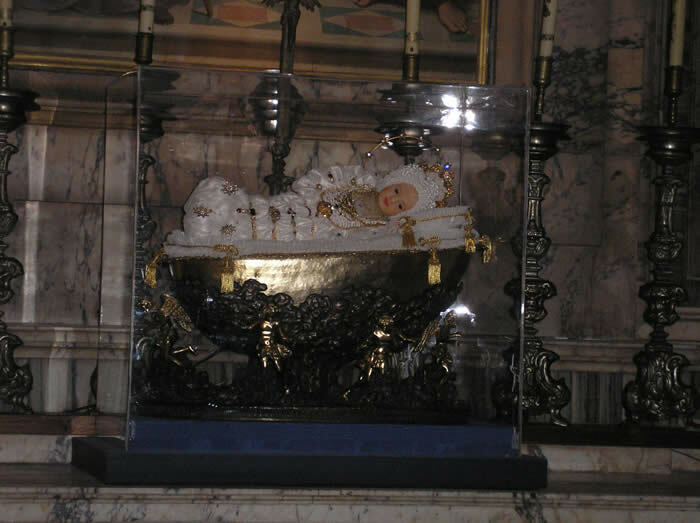 The angels rejoiced around the crib where Good Saint Anne placed her all-holy daughter, who had been conceived without any stain of Original Sin nine months before, that is, on December 8. The New Eve, whose act of perfect obedience to the will of God the Father at the moment that Saint Gabriel the Archangel announced to her that she would be the very Mother of God untied the knot of the first Eve's prideful disobedience in the Garden of Eden, shone at her Nativity with exterior beauty and brightness that reflected the interior beauty and brightness of her immortal soul, filled with grace at the very moment of Immaculate Conception. 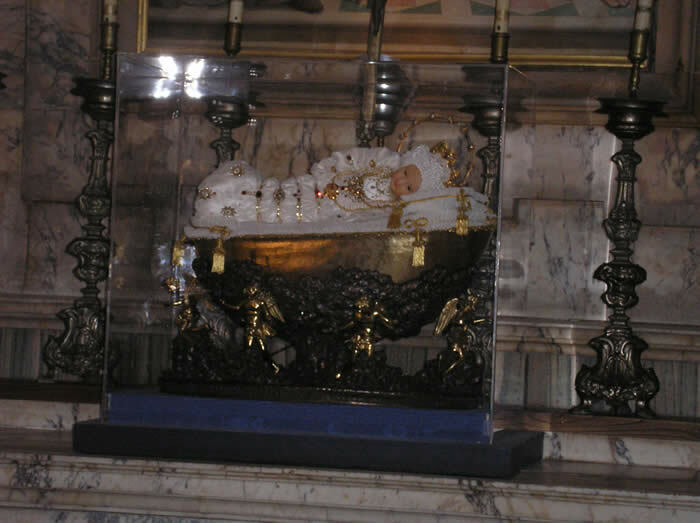 The favor of God rested upon Our Lady from all eternity. We would not have any chance of getting to Heaven if Our Lady had not been conceived and born. We have no chance of getting to Heaven without Our Lady's help, which is why we, as the consecrated slaves of her Divine Son, Our Blessed Lord and Saviour Jesus Christ through her own Sorrowful and Immaculate Heart, must cling to her at all times, especially by means of wearing--and the fulfilling the terms of our enrollment in--her Brown Scapular and by praying as many Rosaries each day as our states-in-life permit. This is a day of great rejoicing. The New Eve, the Ark of the New Covenant, the Gate of Heaven, the Morning Star, the Tower of David, the House of Ivory, the House of Gold, the Mirror of Justice, the Seat of Wisdom, indeed, the Mother of God was born on this day. Words from a sinner whose immortal soul has been stained all too frequently by his all-too-casual embrace of the very thing, sin, from which Our Lady was preserved from the first moment of her conception and which caused her Immaculate Heart to break at the foot of the Cross are inadequate to describe the glory and the profundity of this day. Unlike the birth of any other child, the birth of Our Lady, who was filled with grace from the moment of her conception, was a cause of angelic rejoicing. She who is higher in glory than all of the choirs of the angels, indeed, she who is the Queen of the Angels, came forth from Saint Anne's womb to be the Singular Vessel of Devotion through which the Logos, the Word through Whom all things were made, would be clothed with a perfect human nature at the moment of the Annunciation. Maria Bambina would become the New Mother of the Living, that is, of all of those who were adopted as sons and daughters of the living God by their regeneration in the baptismal font. Poor, recidivist sinners have an advocate before the Throne of Grace in Our Lady of Grace, the Mediatrix of all graces, the Co-Redemptrix, our Advocate. We intercede with her every time we pray the Hail Mary, asking her to pray for us nunc, et in hora mortis nostrae. We who would be lost without her and must endeavor never to lose our tender devotion to her and to make this day, Marymas, one of true celebration, starting with Holy Mass itself. It is best to let saints and learned, holy priests discourse on the glories of this great feast. Men usually celebrate the birth of their children with great feasts and rejoicings; but they should rather pity them, and show signs of mourning and grief on reflecting that they are born, not only deprived of grace and reason, but worse than this--they are infected with sin and are children of wrath, and therefore condemned to misery and death. It is indeed right, however, to celebrate with festivity and universal joy the birth of our infant Mary; for she first saw the light of this World a babe, it is true, in point of age, but great in merit and virtue. Mary was born a saint, and a great saint. But to form an idea of the greatness of her sanctity, even at this early period, we must consider, first, the greatness of the first grace with which God enriched her; and secondly, the greatness of her fidelity in immediately corresponding to it. To begin with the first point, it is certain that Mary's soul was the most beautiful that God had ever created; nay more, after the work of the Incarnation of the Eternal Word, this was the greatest and most worthy of Himself than an omnipotent God ever did in the world. St. Peter Damian calls it "a work only surpassed by God." Hence it follows that divine grace did not come into Mary by drops as in other saints, but like rain on the fleece, as it was foretold by David. The soul of Mary was like fleece, and imbibed the whole shower of grace, without losing a drop. St. Basil of Seleucia says, "that the holy Virgin was full of grace, because she was elected and pre-elected by God, and the Holy Spirit was about to take full possession of her." Hence she said, by the lips of Ecclesiasticus, My abode is in the full assembly of saints; that is, as St. Bonaventure explains it, "I hold in plenitude all that other saints have held in part." And St. Vincent Ferrer, speaking particularly of the sanctity of Mary before her birth, says "that the Blessed Virgin was sanctified" (surpassed in sanctity) "in her mother's womb above all saints and angels." It is not a private opinion [the doctrine of the Immaculate Conception was defined solemnly by Pope Pius IX in 1854] only says a learned author, Father La Colombiere, but it is the opinion of all that the holy child, when she received sanctifying grace in the womb of Saint Anne, received also the perfect use of her reason, and was also divinely enlightened in a degree corresponding to the grace with which she was enriched. So that we may well believe, that from the first moment that her beautiful soul was united to her most pure body, she, by the light she had received from the wisdom of God, knew well the eternal truths, the beauty of virtue and above all, the infinite goodness of God; and how much he deserved to be loved by all, and particularly by herself, on account of the singular gifts with which he had adorned and distinguished her above all creatures, by preserving her from the stain of original sin, by bestowing on her so immense grace, and destining her to be the Mother of the Eternal Word, and Queen of the universe. Hence from that first moment Mary, grateful to God, began to do all that she could do, by immediately and faithfully trafficking with that great capital of grace which had been bestowed upon her; and applying herself entirely to please and love the divine goodness, from that moment she loved him with all her strength, and continued thus to love him always, during the whole of the nine months preceding her birth, during which she never ceased for a moment to unite herself more and more closely with God by fervent acts of love. She was already free from original sin, and hence was exempt from every earthly affection, from every irregular movement, from every distraction, from every opposition on the part of the senses, which could in any way have hindered her from always advancing more and more in divine love; her senses also concurred with her blessed spirit in tending towards God. Hence her beautiful soul, free from every impediment, never lingered, but always flew towards God, always loved him, and always increased in love towards him. Indeed, Our Lady is the vine that grew up on the planted tree of the Divine Word she made incarnate in her own virginal and immaculate womb by the power of God the Holy Ghost. And as God the Holy Ghost ordered the calendar of Roman Rite of the Catholic Church over the course of time, it is interesting to note that only three births are commemorated in the whole of the liturgical calendar: Our Lord's, His cousin Saint John the Baptist, and the Blessed Mother herself. Many learned theologians say that a soul that possesses a habit of virtue, as long as it corresponds faithfully to the actual grace which it receives from God, always produces and equal act in intensity to the habit it possesses, so much so that it acquires each time a new and double merit, equal to the sum of all the merits previously acquired. This kind of augmentation was, it is said, granted to the angels in the time of their probation; and if it was granted to the angels, who can ever deny that it was granted to the divine Mother when living in this world, and especially during the time of which I speak, that she was in the womb of her mother, in which she was certainly more faithful than the angels in corresponding to divine grace? Mary, then, during the whole of that time, in each moment, doubled that sublime grace which she possessed from the first instant; for, corresponding to her whole strength, and in the most perfect manner in her every act, she subsequently doubled her merits in every instance. So that supposing she had a thousand degrees of grace in the first instance, in the second she had two thousand, in the third four thousand, in the fourth eight thousand, in the fifth sixteenth thousand, in the sixth thirty-two thousand. And we are as yet only at the sixth instance; but multiplied this for an entire day, multiplied for nine months, consider what treasures of grace, merit, and sanctity Mary had already acquired at the moment of her birth? Let us, then, rejoice with our beloved infant, who was born so holy, so dear to God, and so full of grace. And let us rejoice, not only on her account, but also on our own; for she came into the world full of grace, not only for her own glory, but also for our good. St. Thomas remarks in his eighth treatise, that the most Blessed Virgin was full of grace in three ways: first, she was filled with grace as to her soul, so that from the beginning her beautiful soul belonged all to God. Secondly, she was filled with grace as to her body, so that she merited to clothe the Eternal Word with her most pure flesh. Thirdly, she was filled with grace for the benefit of all, so that all men might partake of it: "She was also full of grace as to its overflowing for the benefit of all men." The angelical Doctor adds, that some Saints have so much grace that it is not only sufficient for themselves, but also for the salvation of many, though not for all men: only to Jesus Christ and to Mary was such a grace given as sufficed to save all: "should any one have as much as would suffice for the salvation of all, this would be the greatest: and this was in Christ and in the Blessed Virgin." Thus far St. Thomas. So that what St. John says of Jesus, "And of His fullness we all have received, the saints say of Mary. St. Thomas of Villanova calls her "full of grace, of whose plentitude all receive;" so so much so that St. Anselm says, "that there is no one who does not partake of the grace of Mary." And who is there in the world to whom Mary is not benign, and does not dispense some mercy? "Who was ever found to whom the Blessed Virgin was not propitious? Who is there whom her mercy does not reach? Is this not a very apt description as to what has happened to so many Catholics in the past forty-five to fifty years years? Is this not an apt description of how even some traditionally-minded Catholics who, when given access to the general public via the mass media, refuse at any time to speak at all about the necessity of relying upon Our Lady, especially by means of her Most Holy Rosary, so that we can grow close to her Divine Son through her Immaculate Heart? That is, there are some Catholics who have access to the mass media who refuse to instruct those who are watching and listening to them that Our Lady holds the key to peace in individual souls and thus to peace within and among nations. Why are we so afraid to give the public honor that is due to Our Lady as the Queen Mother of the King Whose Social Reign she wants to see restored in all of its glory. It is bad enough that so many Catholics refuse to be devoted to Our Lady even privately. It is worse yet that those who know better are more afraid of losing "access" (and perhaps income) to the mass media rather than giving honor Our Lady, born for us this day so that she could give a spiritual rebirth to us at the foot of her Divine Son's Cross as He paid back in His Sacred Humanity the blood debt of human sin that was owed to Him in His Infinity as God. Joachim, seeing himself, thus rejected, was ashamed to go home and face the contempt of his kinsmen, who had heard the priest's denunciation. Instead he went and lived with his shepherds. Then one day an angel appeared with great brilliance to him when he was alone. He was disturbed by the apparition, but the angel told him not to be afraid and said: "I am an angel of the Lord, sent to announce to you that your prayers have been heard and your alms have ascended in the sight of the Lord. I have seen how you were put to same, and heard the reproach of childlessness wrongly put upon you. God punishes not nature but sin, and therefore, when he closes a woman's womb, he does this in order to open it miraculously later on, and to make it known that what is born is not the fruit of carnal desire but of the divine generosity. Did not the first mother of your race suffer the shame of childlessness until she was ninety years old, and yet bore Isaac, to whom was promised the blessing of all nations? Was not Rachel barren for a long time and yet bore Joseph, who had power over all Egypt? Who was stronger than Samson or holier than Samuel? Yet they both had sterile mothers. Believe these reasons and examples, which show that delayed conceptions and infertile childbearing are usually all the more wonderful! So then, your wife will bear you a daughter and yo will call her Mary. As you have vowed, she will be consecrated to the Lord from infancy and filled with the Holy Spirit from her mother's womb. She will not live outside the common people but will abide in the Temple at all times, lest any sinister suspicion be aroused about her. And, as she will be born of an unfruitful mother, so, miraculously, the Son of the Most High will be born of her. His name will be Jesus, and through him all nations will be saved. And let this be a sign to you: when you arrive at the Golden Gate of Jerusalem, Anna your wife will be there waiting for you. She has been worried because you were so late and will be glad at the sight of you." With these words the angel left him. Having made their offering, Joachim and Anna left their daughter in the Temple with the other virgins and went home. Mary advanced steadily in all holiness. Angels visited her every day, and she enjoyed the vision of God daily. In a latter to Chromatius and Heliodorus, Jerome says that the Blessed Virgin had made a rule for herself: the time from dawn to the third hour she devoted to prayer, from the third to the ninth hour she worked at weaving, and from the ninth hour on she prayed without stopping until and angel appeared and brought her food. The day of the Blessed Virgin's birth was unknown to the faithful for a long time. Then, as John Beleth tells it, there was a holy man, diligent in the practice of contemplation, who every year on the eighth day of September, heard, as he prayed, the joyous choirs of angels chanting solemn paeans. He devoutly prayed to know why he heard this annually on this day and on no other. He received a response from God, that on this day the glorious Virgin Mary had been born to the world, and that he should make this known to the children of Holy Church so that they might join the court of heaven in celebrating her birthday. He passed this knowledge on to the supreme pontiff and others, and they, fasting and praying and searching the Scriptures and ancient documents to ascertain the truth, decreed that this day should be celebrated throughout the world in honor of holy Mary's birth. There was a cleric who loved the Blessed Virgin devotedly and recited her hours faithfully. When his parents died, having no other offspring they left their whole estate to him. His friends them pressed him to take a wife and manage his heritage. On the appointed day he was on the way to his wedding and was passing a church, when he remembered his service to Mary, went into the church, and began to say her hours. The Blessed Virgin appeared to him and, as if angry, said: "O foolish, unfaithful man!" Why are you leaving me, your friend and spouse, for another woman?" The cleric was filled with remorse at this, but he returned to his companions, hiding his distress, and went through with the wedding. At midnight, however, he left everything behind and fled from his house, entered a monastery, and devoted himself to Mary's service. The priest of a certain parish, a man of virtuous life, knew no other mass than the mass of the Blessed Virgin Mary, which he celebrated day after day in her honor. This was brought to the bishop's attention, and he called the priest in immediately. The priest told him that he did not know any other mass. The bishop scolded him harshly, called him an impostor, suspended him from his parish duties, and forbade him to celebrate Mary's mass. The following night Blessed Mary appeared to the bishop, rebuked him severely, and asked why he had treated her servant so badly. She added that he would die within thirty days unless he reinstated the priest in his parish. The bishop, shaken, summoned the priest, begged his pardon, and ordered him to celebrate no other mass than the one he knew, the mass of the Virgin Mary. There is a salutary lesson in that last story for each one of us, that we must amend our ways and be assiduous in a daily acts of love for and devotion to the woman who made possible our salvation by her perfect fiat when Saint Gabriel the Archangel announced to her that she would be the Mother of God. I know that my sins deserved a sentence of eternal damnation. My only hope is that Our Lady, the Queen of Mercy, our life, our sweetness, and our hope, will continue to intercede for me to live penitentially and to amend my ways on a daily basis, offering up to her Sorrowful and Immaculate Heart whatever merit I am able to achieve in this mortal life in cooperation with the graces won for us by the shedding of her Divine Son's Most Precious Blood on the wood of the Holy Cross and flow through her, the Mediatrix of all graces. Most holy Mary, being conceived without sin (as just described), by that first vision She had of the Divinity remained entirely absorbed in spirit and elevated by the Object of her love, a love which began in the narrow tabernacle of the maternal womb at the instant in which her most blessed soul was created, and was never to be interrupted, but rather to continue through all the eternities of that high glory which She now enjoys at the right hand of her divine Son. So She could grow in the contemplation and love of God, in addition to the infused species of knowledge She received of other created things, and the knowledge which resulted from her first vision of the most holy Trinity, and so She could exercise Herself in many acts of virtue possible to Her in the womb, the Lord repeated the wonderful vision and abstractive manifestation of his divinity on two other occasions. Hence the blessed Trinity manifested Himself to Her in abstractive vision three times before her birth: First at the instant of her Conception, then in the fourth or fifth month, and the third time on the day before her birth. However, it must not be inferred that although this abstractive vision was not continual She failed to have another more inferior type of vision, itself very exalted and superior to the one by which She perceived the essence of God by the light of faith, for in most holy Mary these lower kinds of visions were incessant and continual, and superior to all visions of the saints during their earthly pilgrimage. 312. This abstractive vision of the Divinity, though not incompatible with her present condition on earth, was nevertheless so high and immediate that it could not well be continuous in her mortal state in which She was to merit the glory of intuitive vision by other acts; rather, it was a special favor to assist Her in attaining thereto, for it left in her soul the impression of the image of the Lord, and raised and consumed her whole being with a burning love of God. These affections were renewed continually during these visions in the most holy soul of Mary while She remained in the womb of St. Anne. Thus it happened that being in full possession of her intellectual faculties, and occupying Herself without intermission in prayer for the human race, in heroic acts of adoration, reverence, and love of God, and in communication with the angels, She did not feel the narrowness and confinement of her natural prison, nor the restriction of her senses, nor the other restraints inseparable from such a state. To all this She gave no heed, living more in her Beloved than in the womb of her mother or in Herself. 313. The last of the three visions was accompanied by new and more wonderful favors of the Lord; it was given to prepare Her for her entrance into the world and for conversation with mortals. In accordance with the divine will the Princess of heaven said to the Word: “Most high God, Lord of my being, Soul of my life and life of my soul, infinite in thy attributes and perfections, incomprehensible, mighty a nd rich in mercies, my King and Sovereign: Out of nothing hast Thou given me existence; without any merits of mine Thou hast enriched me with the treasures of thy divine light and grace, that by them I could instantly perceive thy immutable Being and divine perfections, and thus Thou wouldst be the first Object of my vision and love, not permitting me to seek any other good than Thee, who art the highest truth and all my consolation. Thou commandest me, my Lord, to issue forth and enter into the material light and converse with creatures. In thy own Being, whence all things are reflected as in a most perfect mirror, I have discerned the dangerous state and the miseries of mortal life. If due to my natural weakness and debility there is danger lest even in the least point I fail in thy love and service, and if it is possible that I die here, let me die now before I pass into a state where I may lose Thee. But if thy holy will, my Lord and Master, is to be fulfilled, and I am to embark on the tempestuous sea of this world, I beseech Thee, most high and mighty God of my soul, to govern my life and direct my steps and all my actions toward pleasing Thee. Order in me holy love (Cant. 2:4), that in the new use which I am to make of creatures, and by thy aid, it may continue to grow. I have perceived in Thee the ingratitude of many souls, and as I am of their nature I fear with good reason that perhaps I may become guilty of the same fault. In this narrow cavity of my mother’s womb I have enjoyed the infinite vastness of thy divinity; here I possessed all good,Thee thyself, my Beloved; and since here Thou alone art my portion and possession (Ps. 72:26), I know not whether outside of this enclosure I may lose it at the sight of the created light and in the use of my senses. If it were possible and appropriate to renounce the dealings of approaching life, I would gladly renounce and lose the experience of it; but let not my will but Thine be done. Therefore since Thou desirest it, confer upon me thy blessing and good will at my entrance into the world, and do not deprive me of thy divine protection during the earthly course in which Thou dost place me.” Having thus poured forth her prayer, the most sweet child Mary received the benediction of the Most High and the command to issue forth into the light of the visible sun, at the same time being enlightened for the fulfillment of all his desires. 314. The most happy mother St. Anne passed the days of her pregnancy altogether spiritualized by the divine operations and the sweet workings of the Holy Ghost in all her faculties. Divine Providence, however, in order to direct her course to greater merit and reward, ordained that the ballast of trouble be not lacking, for without it the cargo of grace and love is scarcely ever secure. In order to understand better what happened to this holy woman, it must be remembered that the demon, after he was hurled with the other bad angels from heaven into the infernal torments, never ceased during the reign of the old Law to search through the earth, hovering with lurking vigilance above the women of distinguished holiness, in order to find Her whose sign he had seen (Apoc. 12:1) and whose heel was to bruise and crush his head (Gen. 3:15). The wrath of Lucifer against men was so fierce that he would not trust this investigation to his inferiors alone, but leaving them to operate against the virtuous women in general, he himself attended to this matter and assiduously hovered around those who signalized themselves more particularly in the exercise of virtue and in the grace of the Most High. 315. Filled with malice and astuteness he observed closely the exceedingly great holiness of the excellent matron Anne and all the events of her life, and although he could not estimate the richness of the Treasure which was enclosed in her blessed womb (since the Lord concealed this as well as many other mysteries from him), yet he felt a powerful influence proceeding from St. Anne. The fact that he could not penetrate into the source of this activity threw him at times into great fury and rage. At other times he quieted himself with the thought that this pregnancy arose from the same causes as others in the course of nature, and hence there was no special cause for alarm, for the Lord left him to his own hallucinations and to the vagaries of his own fury. Nevertheless the whole event was a source of great misgiving to this perverse spirit when he saw how quietly her pregnancy took its course, and especially when he saw that many Angels stood in attendance. Above all he was enraged at his weakness in resisting the force which proceeded from St. Anne, and he suspected that it was not she alone who was the cause of it. 316. Filled with this mistrust the dragon determined, if possible, to take the life of most blessed Anne; and if he could not succeed in this, at least try to obtain some wicked joy out of her pregnancy, for the pride of Lucifer was so boundless as to persuade him of his ability to overcome or take away the life of Her who was to be the Mother of the incarnate Word, or even the life of the Messiah and Redeemer of the world, if only he could obtain knowledge of their whereabouts. His arrogance was founded upon the superiority of his angelic nature to the condition and power of mere human nature, as if both were not subject to grace and entirely dependent upon the will of their Creator. Audaciously therefore he set about tempting St. Anne with many suggestions, misgivings, doubts and hesitations about the truth of her pregnancy, alleging her protracted years. All this the demon attempted in order to test the virtue of the Saint, and to see whether these temptations would give some opening for the perversion of her will. besides the protection abundantly merited by her past life she was defended and freed from the demons by the great Princes who were guarding her most holy Daughter. Nevertheless in his insatiable malice the enemy did not desist on that account, and since his arrogance and pride far exceed his powers he sought human aid, for with such help he always promises himself greater ease of victory. Having at first tried to overthrow the dwelling of Sts. Joachim and Anne so she might be frightened and excited by the shock of its fall, but not being able to succeed due to the resistance of the holy Angels, he incited against St. Anne one of the foolish women of her acquaintance to quarrel with her. This the woman did with great fury, insolently attacking St. Anne with reproach and scorn. She did not hesitate to make a mockery of her pregnancy, saying that she was the sport of the demon in being thus found pregnant after so many years and at so great an age. 318. St. Anne was not disturbed by this temptation, but rather with all meekness and charity suffered the injuries and cherished those who dealt them. From that time on she looked upon these women with affection and lavished upon them greater benefits. But their wrath was not immediately pacified, for the demon had taken possession of them, filling them with hatred against the Saint; and since any concession to this cruel tyrant always increases his power over his victims, he incited these miserable dupes to even plot against the person and life of St. Anne. But they could not put their plots into execution because divine power interfered to foil their natural womanly weakness. They were not only powerless against the Saint, but they were overcome by her admonitions and brought to the knowledge and amendment of their evil course by her prayers. 319. The dragon was repulsed but not vanquished, for he immediately availed himself of a maid who served the saintly couple, and exasperated her against the holy matron. Through her he created an even greater annoyance than through the other women, for she was a domestic enemy and more stubborn and dangerous than the others. I will not stay to describe what the enemy attempted through this servant, since it was similar to that of the other woman, only more annoying and malicious. But with the help of God St. Anne won a more glorious victory than before, for the watcher of Israel slumbered not, but guarded his holy City (Ps. 120:4) and furnished it so well with sentinels, chosen from the strongest of his hosts, that they put to ignominious flight Lucifer and his followers. No more were they allowed to molest the fortunate mother, who was already expecting the birth of the most blessed Princess of heaven, and who, enriched by heroic acts of virtue and many merits in these conflicts, had now arrived at the fulfillment of all her highest desires. I too desire to come to an end with this chapter in order to hear the salutary instructions of my Mistress and Teacher, who besides assisting me in all that I write also favors me with her maternal admonitions which I receive with highest joy and exultation of my spirit. the visions of the Divinity, wast filled in spite of all these graces with so great a fear and anxiety of offending Him and losing the friendship of God? If in the first instant of thy existence Thou wast prevented by grace, how couldst Thou at that very instant fear to lose it? If the Most High exempted Thee from original sin, how couldst Thou fall into others, or fear to offend Him, who had preserved Thee from the first offense? INSTRUCTION AND ANSWER OF THE QUEEN OF HEAVEN. ing their dependence on the merits of my most holy Son that the soul immediately centers its attention only on its own unworthiness and insufficiency, convinced that it cannot merit them and that it cannot appropriate them to itself as being foreign to its nature. Since they are seen to belong to such a high Master, to whom they can revert to be distributed according to his pleasure, a most deeply felt solicitude fills the soul lest it lose what is thus freely given. The soul therefore begins to work with great diligence in order to preserve them and multiply the talent (Mt. 25:16), since it understands that to be the only means of keeping the deposit and fulfilling the object for which it was given, namely to make it bear fruit and contribute to the glory of the Creator. This care is precisely the condition necessary for the preservation of the benefits and graces received. 322. Besides this the soul is made to understand human frailty and freedom of the will for good or evil. Of this knowledge the Almighty did not deprive me, nor does He deprive anyone of it as long as he wanders through this life, but gives it to all according to measure, that by its guidance they may be filled with holy fear of falling into any fault, even the smallest. In me this light was greater, and I clearly saw that a small fault prepares the way for another, and that the second is only a punishment of the first. It is true that because of the blessings and graces of the Lord sin was impossible in me, but his providence so disposed of this knowledge that my absolute security from sin was hidden from me; I saw that as far as depended on myself alone I could fall, and that it was the divine will which preserved me. Thus He reserved to Himself his knowledge of my security from sin, and left me in solicitude and holy fear of sinning during my pilgrimage. From the instant of my Immaculate Conception until my death I never lost this fear, but on the contrary grew in it as my life progressed. diminish love, but inflamed and increased it more and more. These two disposit ions of love and fear produced in my soul a perfect harmony with the divine will, governing all my actions so as to draw me away from evil and unite me with the highest Good. 325. The day of the parturition of St. Anne and for the birth of most holy Mary, who was consecrated and sanctified to be the Mother of God, had arrived, a joyous day for the world. This birth happened on the eighth day of September, completing nine months since the Immaculate Conception of our most holy Queen and Lady. St. Anne was prepared by an interior voice of the Lord which informed her that the hour of her parturition had come. Full of the joy of the Holy Ghost at this information, she prostrated herself before the Lord and besought the assistance of his grace and his protection for a happy deliverance. Presently she felt a movement in her womb similar to that which is proper to creatures being born to the light. The most blessed child Mary was at the same time by divine Providence and power ravished into a most exalted ecstasy; hence She was born into the world without perceiving it by her senses, for their operations and faculties had been suspended. Since She had the use of her reason She would have perceived it by her senses if they would have been left to operate in their natural manner at that time; however, the Almighty disposed otherwise so the Princess of heaven would be spared the sensible experience otherwise connected with birth. 326. She was born pure and stainless, beautiful and full of grace, thereby demonstrating that She was free from the law and tribute of sin. Although She was born substantially like other daughters of Adam, yet her birth was accompanied by such circumstances and conditions of grace that it was the most wonderful and miraculous birth in all creation and will eternally redound to the praise of her Maker. At twelve o’clock in the night this divine Luminary issued forth, dividing the night of the ancient Law and its initial darkness from the new day of gracewhich was now dawning. She was clothed, handled and dressed like other infants, though her soul dwelt in the Divinity, and She was treated as an infant, though She excelled all mortals and even all the angels in wisdom. Her mother did not allow Her to be touched by other hands than her own, but she herself wrapped Her in swaddling clothes, and in this St. Anne was not hindered by her present state of childbirth, for she was free from the toils and labors which other mothers usually endure in such circumstances. 328. The Lord answered the holy matron interiorly that she was to treat her heavenly Child outwardly as mothers treat their daughters, without any demonstration of reverence, but to retain this reverence inwardly, fulfilling the laws of a true mother toward Her, and raising Her with all motherly love and solicitude. With all this the happy mother complied; making use of this permission and her rights as mother without losing her reverence, she regaled herself with her most holy Daughter, embracing and caressing Her in the same way as oher mothers do with their daughters, but it was always done with a proper reverence and consciousness of the hidden and divine sacrament known only to the mother and Daughter. The Guardian Angels of the sweet Child with others in great multitudes showed their veneration and reverence to Mary as She rested in the arms of her mother; they joined in heavenly music, some of which was audible also to St. Anne. The thousand Angels appointed as guardians of the great Queen offered themselves and dedicated themselves to her service. This was also the first time in which the heavenly Mistress saw them in a corporeal form with their devices and emblems, as I shall describe in another chapter (Con. 360ff. ), and the Child asked them to join with Her in the praise of the Most High and exalt Him in her name. 329. At the moment of the birth of our Princess Mary the Most High sent the archangel Gabriel as an envoy to bring this joyful news to the holy Fathers in limbo. Immediately the heavenly ambassador descended, illumining that deep cavern and rejoicing the just who were detained therein. He told them the dawn of eternal happiness had already begun, and the reparation of man, which was so earnestly desired and expected by the holy Patriarchs and foretold by the Prophets, had begun, since She, who was to be the Mother of the Messiah, had now been born, and soon would they see the salvation and glory of the Most High. The holy Prince gave them an understanding of the excellence of most holy Mary and what the Omnipotent had begun to work in Her so they could better comprehend the happy beginning of the mystery which was to end their prolonged imprisonment. Then all the holy Patriarchs and Prophets and the rest of the just in limbo rejoiced in spirit, and in new canticles praised the Lord for this benefit. 330. All these happenings at the birth of our Queen succeeded each other in a short space of time. The first exercise of her senses in the light of the material sun was to recognize her parents and other creatures. The powerful arm of the Most High began to work new wonders in Her far above all the conceptions of men, and the first and most stupendous one was to send innumerable Angels to bring the Mother of the eternal Word body and soul to the empyrean heaven for thefulfillment of his further intentions regarding Her. The holy Princes obeyed the divine mandate, and receiving the child Mary from the arms of her holy mother Anne they arranged a new and solemn procession, bearing heavenward with incomparable songs of joy the true Ark of the Covenant, so for a short time She would rest not in the house of Obededom but in the temple of the King of kings and Lord of lords, where later on She was to be placed for all eternity. This was the second step which most holy Mary made in her life, namely from this earth to the highest heaven. 331. Who can worthily extol this wonderful prodigy of the right hand of the Almighty? Who can describe the joy and the admiration of the celestial spirits when they beheld this new and wonderful work of the Most High, and when they gathered to celebrate it in their songs? In these songs they acknowledged and reverenced Her as their Queen and Mistress, She who was to be the Mother of their Lord and the cause of the grace and glory which they possessed, since it was through his foreseen merits they had been made the recipients of the divine bounty. But above all what human tongue or what mortal could ever describe or comprehend the secrets of the Heart of that tender Child during these events? I leave this to Catholic piety, and still more to those who in the Lord are favored with an understanding of it, but most of all to those who by the divine bounty shall arrive at the beatific vision face to face. 332. Borne by the hands of the Angels the child Mary entered the empyrean heaven, where She prostrated Herself full of love before the royal throne in the presence of the Most High. Then (according to our way of understanding) was verified what long before had happened in figure, when Bethsabee entered into the presence of her son Solomon (III Kg. 2:19), who while presiding over his people of Israel arose from his throne, received her with honor and reverence, and seated her at his side as queen. Similarly, but in a more glorious and admirable manner, the Person of the divine Word now received the child Mary, whom He had chosen for his Mother and Queen of all creation, though She remained ignorant of her own dignity and the purpose of such ineffable mysteries and favors; yet in order to receive them her weak faculties were invigorated by divine power. New graces and gifts were best owed upon Her by which her faculties were correspondingly elevated. Her powers of mind, besides being illumined and prepared by new grace and light, were raised and proportioned for that which He was to manifest, and the Divinity was displayed in the new light vouchsafed, revealing Himself to Her intuitively and clearly in a most exalted manner. This was the first time in which the most holy soul of Mary saw the blessed Trinity in unveiled beatific vision. 333. The sole witnesses of the glory of the child Mary in this beatific vision, of the sacraments revealed to Her anew, and of the divine effects which overflowed into her most pure soul, were God, the Author of this unheard of wonder, and the astounded angels, who in some measure perceived these mysteries in God himself. The Queen, seated at the side of the Lord, who was to be her Son, and seeing Him face to face, was more successful in her prayer than Bethsabee (Ib. 21), for She prayed that He bestow the untouched Sunam itess bisag, his inaccessible divinity, upon his own brother, human nature; She prayed that his promised coming from heaven to the earth and his marriage with human nature by the hypostatic union be fulfilled in the Person of the Word. Many times had He pledged Himself to it among men through the ancient Patriarchs and Prophets, and now She besought Him to accelerate the reparation of the human race, expected for so many ages amid the multiplied iniquities and perdition of souls. The Most High heard this most pleasing petition of his Mother, and acting more graciously than Solomon of old toward his mother, He assured Her that soon his promises would be fulfilled and He would descend to the world in order to assume and redeem human nature. 334. In this divine consistory and tribunal of the most holy Trinity it as determined to give a name to the Child Queen. Since there is no proper and legitimate name except it be founded in the immutable being of God himself (for from Him are dispensed and ordered according to their right weight and measure all things in infinite wisdom), His Majesty himself desired to give and impose this name in heaven. He thereby made known to the angelic spirits that the three divine Persons had formed and decreed the sweet names of Jesus and Mary for the Son and Mother from the beginning before the ages, and had been delighted with them and engraved them in their eternal memory, being present to Them when They had given being to all created things, because for the service of Jesus and Mary they were created. Havingbeen informed of these and many other mysteries the holy angels heard a voice from the throne speaking in the Person of the Father: “Our chosen One shall be called Mary, and this name is to be powerful and magnificent. Those who shall invoke it with devout affection shall receive most abundant graces; those who shall honor it and pronounce it with reverence shall be consoled and vivified, and shall find in it the remedy of their evils, the treasures for their enrichment, and the light which shall guide them to heaven. It shall be terrible against the powers of hell, it shall crush the head of the serpent, and it shall win glorious victories over the princes of darkness.” The Lord commanded the angelic spirits to announce this glorious name to St. Anne so what was decreed in heaven could be executed on earth. The heavenly Child, lovingly prostrate before the throne, rendered most acceptable and humble gratitude to the eternal Being, and She received the name with most admirable and sweet jubilation. If the prerogatives and graces with which She was then favored were to be described it would necessitate an extra book of many volumes. The holy angels honored and acknowledged most holy Mary as the future Mother of the Word and as their Queen and Mistress enthroned at the right hand of her Son. They showed their veneration of her holy Name, prostrating themselves as it proceeded from the throne in the voice of the eternal Father, especially those who had it written on the devices in their bosom. All of them gave forth canticles of praise for these great and hidden mysteries. In the meanwhile the infant Queen remained ignorant of the real cause of all that She thus experienced, for her dignity of Mother of the incarnate Word was not revealed to Her until the time of the Incarnation. With the same reverential jubilation did the Angels return in order to replace Her into the arms of St. Anne, to whom this event remained a secret, as was also the absence of her Daughter, for a Guardian Angel, assuming an aerial body, supplied her place for this very purpose. More than that, during a great part of the time in which the heavenly Child remained in the empyrean heaven her mother was rapt in an ecstasy of highest contemplation, and in it, although she did not know what was happening to the Child, exalted mysteries concerning the dignity of the Mother of God, to which She was to be chosen, were revealed to her. The prudent matron kept them enshrined within her bosom, conferring them in her thoughts with the duties she owed to her Child. 335. On the eighth day after the birth of the great Queen multitudes of most beautiful Angels in splendid array descended from on high bearing an escutcheon on which the name of MARY was engraved and shone forth in great brilliancy. Appearing to the blessed mother Anne they told her the name of her daughter was to be MARY, which name they had brought from heaven, and which divine Providence had selected and now ordained to be given to their Child by Joachim and herself. The Saint called for her husband and they conferred with each other about this disposition of God in regard to the name of their Daughter. The more than happy father accepted the name with joy and devout affection. They decided to call their relatives and a priest. and then with much solemnity and festivity they imposed the name of Mary on their Child. The Angels also celebrated this event with most sweet and ravishing music which, however, was heard only by the mother and her most holy Daughter. Thus was the divine Princess named by the holy Trinity: In heaven on the day of her nativity, and on earth after eight days. This name was written on the list of other names when her mother presented herself at the temple according to the law, as I shall relate further on. This was the birth like to which none had been before, and the like of which cannot again happen in mere creatures. This was the most blessed birth of which nature was capable, for by it an Infant came into existence whose entrance into the world was not only free from all the impurities of sin, but who was more pure and holy than the highest Seraphim, The birth of Moses was celebrated because of the beauty and handsomeness of the infant (Ex. 2:2), but all his beauty was only corruptible and apparent. But O how beautiful is our great Child (Cant. 7:6)! O how beautiful! She is entirely beautiful and most sweet in her delights, since She possesses all grace and beauty without lacking any. The laughter and joy of the house of Abraham was the birth of the promised Isaac (Gen. 21: 6), conceived in a sterile womb; but this joy was great only because it foreshadowed and was derived from the birth of our infant Queen, toward which all this joy of Abraham was only a step. If that birth was so admirable and full of joy for the family of the Patriarch because it was a foreshadowing of the birth of sweetest Mary, heaven and earth should rejoice at her birth, She who gave a beginning to the restoration of heaven and the sanctification of the world. When Noah was born his father Lamech was consoled (Gen. 5:29), because in that son God had provided a progenitor of the human race in the ark and assured a restoration of the blessings which the sins of men had forfeited. But all this happened merely as a type to foreshadow the birth of this Child, who was to be the true Reparatrix, being the mystical Ark which contained the new and true Noah and which drew Him down from heaven who was to fill with benediction all the inhabitants of the earth. O blessed birth! O joyful nativity, the most pleasing tothe blessed Trinity in all the ages of the past, the joy of the angels, the relief of sinners, the delight of the just, and the singular consolation of all the holy souls in limbo! 336. O precious and rich pearl, who didst come forth to the light of the sun still enclosed within the rough shell of this world! O sublime Infant, who though scarcely noticed by terrestrial eyes in the material light, yet in the eyes of the highest King and his courtiers dost exceed all that is not God in dignity and grandeur! Let all generations bless Thee, and let all nations recognize and praise thy grace and beauty! Let the earth be made illustrious by thy birth; let mortals be rejoiced because their Mediatrix is born who shall fill up the vast emptiness of original sin. Let thy gracious condescension toward me be blessed and extolled, who am the most abject dust and ashes. If Thou givest me permission, O my Lady, to speak in thy presence, I will propose a doubt which occurred to me in describing the mystery of thy most admirable and holy birth, namely regarding an act of the Almighty at the hour of thy coming forth into the material light of the sun. 337. And this is the doubt: How are we to understand thy being raised in thy body by the hands of the holy Angels into the empyrean heaven and to the vision of God? For according to the teaching of the holy Church and her doctors, heaven was closed and as it were interdicted to man until thy most holy Son would open it through his life and death, and until He himself, as Redeemer and Head, would enter it on the day of his admirable Ascension, He being the first one for whom these eternal portals were to be opened after their being closed up by sin. ANSWER AND INSTRUCTION OF THE QUEEN OF HEAVEN. 338. My dearest daughter, it is true divine justice closed heaven against mortals due to the first sin until my most holy Son would open it by satisfying most abundantly for men through his earthly life and death. It was befitting and just that this same Redeemer, who had united to Himself the redeemed members and opened heaven, would as their Head enter before any of the children of Adam. If Adam had not sinned it would not have been necessary to follow this course, for men would have ascended of themselves in order to enjoy the Divinity in the empyrean heaven. However, having foreseen the fall of man, the most blessed Trinity provided for the course followed at present. This great mystery was referred to by David in Psalm XXIII when, speaking of the spirits of heaven, he repeats twice lift up your gates, O ye princes, and be ye lifted up, O eternal gates, and the King of Glory shall enter in (Ps. 23:7). They are here called the gates of the angels, because only for them were they open, but for mortal men they were closed. Although these heavenly courtiers were aware of the fact that the incarnate Word had already thrown back the bars and bolts of guilt, and that He was now ascending rich and glorious with the spoils of death and sin, bringing with Him the fruits of his Passion in the accompanying hosts of the glorious saints released from limbo, nevertheless the holy angels give vent to their admiration and breathless suspense at this wonderful novelty, asking: Who is this King of Glory (Ib. 8), being man and of the same nature as the one who had lost for himself and for his entire race the right to enter into heaven? 339. They themselves give answer to the question, saying: The Lord who is strong and mighty in battle, the Lord of virtues, the King of Glory (Ib. 8, 10). This was as if they confessed their conviction that this Man who was now coming up from the world in order to open the eternal gates was not a mere man and is not included under the law of sin, but was true God and true man who, strong and powerful in battle, had overcome the strong-armed one (Lk. 11:21-22) who reigned in the world, had taken away his reign, and despoiled him of his weapons. And He was the Lord of virtues (Ps. 23:10) who had exercised them as a Master, with sovereignty over them, and without any contradiction of sin and its effects. As the Lord of virtues and as the King of Glory He now came in triumph, distributing virtues and glory to his redeemed, for whom as man He had suffered and died, and whom as God He was now raising up to the eternal and beatific vision, having broken the bars and shackles imposed by sin. 340. Since this, O soul, was the work of my dear Son, the true God and man, He, as the Lord of virtues and graces, exalted and adorned me with them from the first moment of my Immaculate Conception. Moreover, since the hindrance of sin touched me not, I was free from the impediments which prevented other mortals from entering into the eternal gates of heaven; on the contrary, the powerful arm of my Son acted with me as being the Mistress of all virtues and as the Queen of heaven. Because He was to vest Himself and assume unto Himself human nature from my flesh and blood, He was beforehand in reparing me and making me like unto Himself in purity and exemption from fault, and in other divine gifts and privileges. Since I was not a slave of sin, I exercised the virtues not as a subject but as a Mistress; without contradiction, but with sovereignty; not like the children of Adam, but like the Son of God, who was also my Son. 341. For these reasons the celestial spirits, who had possession of the eternal gates as their own, opened them up for me, perceiving that the Lord had created me more pure than all the most exalted spirits in heaven and made me their Queen and the Mistress of all creation. Remember also, my dearest, that he who makes the law can also dispense with it freely, and this the supreme Lord and Legislator did with me, extending the scepter of his clemency toward me more readily than Assuerus did to Esther (Esther 15:14-15), for the common laws regarding others and consequent upon their guilt did not apply to me (Ib. 13), who was to be the Mother of the Author of grace. Though I could not as a mere creature merit such blessed privileges, yet the divine clemency and goodness of God turned toward me with full liberality, and He was pleased with the humility of his servant, so for all eternity the Author of such prodigies would be praised. Do thou also, my daughter, according to my directions bless and magnify Him for these benefits bestowed upon me. 342. My admonition to thee, whom in spite of thy weakness and poverty I have chosen with such generous kindness as my disciple and companion, is this, for thee to strive with all thy powers to imitate me in an exercise in which I persevered during my whole life from the very first moment of my birth, omitting it on not a single day, however full of cares and labors it might have been. This exercise was the following: Every day at the beginning of dawn I prostrated myself in the presence of the Most High and gave Him thanks and praise for his immutable Being, his infinite perfections, and for having created me out of nothing; acknowledging myself as his creature and the work of his hands, I blessed Him and adored Him, giving Him honor, magnificence and divinity, as the supreme Lord and Creator of myself and of all that exists. I raised up my spirit to place it into his hands, offering myself with profound humility and resignation to Him, and asking Him to dispose of me according to his will during that day and during all the days of my life, and to teach me to fulfill whatever would be to his greater pleasure. This I repeated many times during the external works of the day, and in the internal ones I first consulted His Majesty, asking his advice, permission and benediction for all my actions. This moving account should fill the heart of every Catholic with a tender appreciation for the great mercies that God has bestowed upon us erring, lukewarm, and indifferent sinners. Our hearts should leap for joy when contemplating the words that are included in The Mystical City of God, inspiring us to develop an ever-more deeply-held reliance upon Our Lady, she who is the Mediatrix of All Graces, the Co-Redemptrix, and Advocate, especially through her Most Holy Rosary and by our total consecration to her Divine Son through her own Sorrowful and Immaculate Heart. No one can be saved without having a tender love for and deep devotion to the Mother of God who was born for us this very day. The birth of Our Lady on this day, September 8, reminds us that we must be reborn constantly in the Sacrament of Penance by having even the seemingly smallest of our venial faults eradicated by regular, humble confessions, resolving ever more to cooperate with the sanctifying graces we receive in this Sacrament of Divine Mercy so that we might make Mary's glories known to all we know and to all we meet, thus aspiring and striving constantly to have the highest place in Heaven next to that of the Blessed Virgin Mary, please her Divine Son that we die in a state of sanctifying grace. We must fly unto Our Lady with every beat of our hearts, consecrated as they must be to her Sorrowful and Immaculate Heart and through that Heart to the Sacred Heart of Jesus. We must trust in Our Lady completely, especially in these times of civil and ecclesiastical confusion, ever standing close to her at the foot of the Cross as the Sacrifice of the Cross is offered in an unbloody manner by an alter Christus in Holy Mass. We must fly unto Our Lady with childlike confidence, surrendering ourselves to her as her consecrated slaves without a moment's hesitation, knowing that she who brought us forth as the adopted children of God in great pain as she stood by the Cross of her Divine Son wants us to call upon her and to know that she hears our prayers and will answer them in ways that will be understood fully only in eternity. Think of Saint Bernard of Clairvaux, who helped to propagate devotion to Our Lady in the Twelfth Century. Think of Saint Dominic de Guzman, to whom Our Lady gave her Most Holy Rosary in the Thirteenth Century. Think of Blessed Father Alan de la Roche, to whom Our Lady begged to promote her Most Holy Rosary anew. Think of Juan Diego, to whom Our Lady gave a miraculous image of herself that still converts the heathen to the true Faith and is meant to convert the entirety of the Americas to Catholicism, the one and only foundation of personal and social order. Think of Mother Mariana de Jesus Torres and the message of Our Lady of Good Success that is so relevant to our times. Think of the Venerable Mary of Agreda, who wrote The Mystical City of God at Our Lady's direction. Think of Saint Alphonsus de Liguori, who wrote so beautifully on the glories of Mary. Think of Saint Louis Grignion de Montfort, who taught us the path of True Devotion to Mary. Think of Saint Catherine Laboure, to whom Our Lady revealed herself as the Mediatrix of all graces and asked for devotion to the Miraculous Medal. Think of Sister Justine Bisqueyburo, to whom Our Lady, on this very day one hundred seventy-one, gave her Green Scapular to save those who are without any other hope or means of saving their souls, doing so in the very same convent of the Daughters of Charity on the Rue de Bac in Paris, France, where she had appeared to Sister Catherine Laboure ten years before. Think of Maximim and Melanie, to whom Our Lady appeared at La Salette in tears of sorrow about the dissolute ways of Catholics and the future of Holy Mother Church in this time of apostasy and betrayal. Think of Saint Bernadette Soubirous, to whom Our Lady appeared at Lourdes to confirm the doctrine of the Immaculate Conception. Think of Father Frederick Faber, whose keen insights into the Dolors of Mary provide us with so much inspiration to this very day. Think of Jacinta and Francisco Marto and Lucia dos Santos, to whom Our Lady appeared in the Cova da Iria at Fatima and entrusted the Message for our times, that concerning the Triumph of her Immaculate Heart and of the necessity of our praying our Rosaries for the conversion and salvation of poor sinners as we attempt to make reparation for our own sins and those of the whole world. Think of how our hearts must burn with desire to see Our Lady pleading for us mercifully at the moment of our Particular Judgment. Today is a day on which we should strive especially diligently to pray all fifteen decades of Our Lady's Most Holy Rosary. Today is a day to get to the Sacrament of Penance, to assist at the Immemorial Mass of Tradition offered by a true bishop or a true priest, to spend time before her Divine Son's Real Presence, to read commentaries about the glories that expressed themselves as Saint Anne gave birth to her beloved daughter, Mary of Nazareth, Our Lady. At length, O Mary, our earth possesses thee! Thy birth reveals to it the secret of its destiny, the secret of that love which called it from nothingness, that it might become the palace of the God who dwelt above the heavens. But what a mystery, that poor, weak humanity, inferior to the angels by nature, should be chosen to give to the angels their King and their Queen! Their Kin they will soon adore, a new-born Babe in thine arms; their Queen they reverence to-day, admiring thee in thy cradle as only angels can admire. In the beginning these morning stars, these noble spirits, contemplated the manifestations of almighty power, and praised the Most High; yet never did their eager gaze discover such a marvel as that which delights their eyes at this hour; God, more purely imaged under a corporeal veil, under the fragile form of an infant one day old, than in all the strength and all the beauty of their nine angelic choirs; God, so captivated by such weakness united, by His grace, to such love, that He made it the culminating point of His work by determining to manifest His Son therein! Dearly beloved brethren, the day for which we have longed, the Feast-day of the Blessed and Worshipful and Ever-Virgin Mary, that day is come. Let our land laugh and sing with merriment, bathed in the glory of this great Virgin's rising. She is the flower of the fields on which the priceless lily of the valleys hath blossomed. This is she whose delivery changed the nature that we draw from our first parents, and cleansed away their offence. At her that dolorous sentence which was pronounced over Eve ended its course to her it was never said: "In sorrow thou shalt bring forth children." Gen. iii. 16. She brought forth a Child, even the Lord, but she brought Him forth, not in sorrow, but in joy. Eve wept, but Mary laughed. Eve's womb was big with tears, but Mary's womb was big with gladness. Eve gave birth to a sinner, but Mary gave birth to the sinless One. The mother of our race brought punishment into the world, but the Mother of our Lord brought salvation into the world. Eve was the foundress of sin, but Mary was the foundress of righteousness. Eve welcomed death, but Mary helped in life. Eve smote, but Mary healed. For Eve's disobedience, Mary offered obedience and for Eve's unbelief, Mary offered faith. These are beautiful words from a saint who was baptized by another saint, Saint Ambrose, after a life of libertine behavior. Saint Augustine came to knew and to love his Heavenly Mother, who heard the pleadings of his own mother, Saint Monica, for his conversion to the Catholic Faith. Happy birthday, dear Blessed Mother. Thank you for suffering as our Co-Redemptrix to make it possible for us to be your spiritual sons by means of adoption, given to us by your Divine Son as your stood beneath His Most Holy Cross to be our Mother in this life and for all eternity. Thank you for being so patient and so kind to us erring sinners. Sancta Maria, Mater Dei, ora pro nobis peccatoribus, for us nunc et in hora mortis nostrae. Amen. Maria Bambina, pray for us. Saint Joseph, chaste spouse of the Mother of God and the foster-father of the Word Who was made flesh in her womb, pray for us. Saint John the Evangelist, given by Our Lord Himself to be Mary's son, pray for us. Saint Dominic, to whom was entrusted the Most Holy Rosary, pray for us. Saint Alphonsus de Liguori, who sang the glories of Mary, pray for us. Saint Louis Grignion de Montfort, apostle of total consecration to Mary, pray for us. Saint Hadrian, pray for us. A blessed Feast of the Nativity of the Blessed Virgin Mary to you all.